and Navy Memorial Museum, Washington D.C. Intricate carvings of wood, jade, ivory, or just about anything else. ~~~ Old Nautical ship clocks, Complicated movements, especially fine solid gold pocket watches, repeaters and wrist watches [such as Breitling, Cartier, Patek, & Rolex; old and new alike]. ~~~ Swords, knives, daggers, German items etc. Special paintings. Nice furniture. 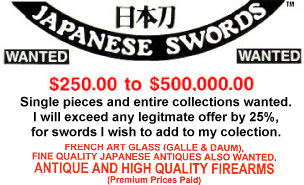 ~~~ Antique firearms, US, European, Japanese (such as fine nambu pistols), especially - Colt's, Winchester's. Guns with Enamels and inlays. US and European swords in Very good condition or presentation, including Bowie knives. ~~~ Any unique items that we have never seen before. Jewels, Chinese pottery, Tiffany lamps. Rare glass. Old Coins or paper currency. Very early Greek and Roman marble. ART- European, UK, US, Oriental. Paintings, Japanese Wood Block prints, Art glass (Galle & Daum, etc. ), Porcelain, Bronze & Marble sculpture, Oriental rugs. ~~~ Scientific Instruments (Clocks, Microscopes, Ship compass, etc.) Rare precious Gems, Baseball memorabilia (I.E. : Presentation items). For Free Estimates please send clear photographs. We have numerous reference books for all of the above. If you do not see something listed that you own, ask us, we may still be able assist you. Please print (or bookmark) this page for future reference, Thank you. For any questions you may email info@samuraisword.com and or view our Contact us page for telephone #s.